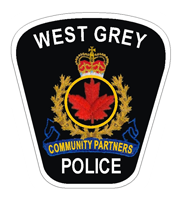 On the evening of Thursday March 21 2019 at approximately 9:50pm, police were contacted with reports of a person 00in mental distress. The caller was concerned with the safety and wellbeing of the individual and requested that police attend the village of Ayton for assistance. Upon police arrival, the victim fled the area, descended a steep wooded incline and ended up falling into the river just north of the Ayton Bridge. The Ayton Fire Department, West Grey Police with the assistance of the Bruce County OPP began a search for the male and he was subsequently located by the Fire Service on the opposite bank of the river at the bottom of a steep bank. The victim had been able to get himself out of the cold water on his own but shortly after being spotted, the victim collapsed on the river bank. Police and Firefighters repelled themselves by rope down the steep bank to provide first aid until the Hanover Fire Rescue Team arrived and successfully extricated the victim without injury. Once safe, Grey County Paramedics transferred the victim to a nearby hospital for further assessment and treatment.